Large single family home with Private pool and Club amneites such as Heated pool, tennis and Work out room. 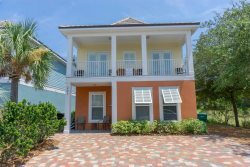 Destin`ed For Fun~Book This Fabulous 4 Bedroom Beach Home For The Perfect Getaway!!! 29/29: Large Rooftop Deck with Amazing Gulf Views. Property Size 4,771 sq. ft.
Suzie Q By the Sea ~ With Private Pool, Private Beach Access and Elevator! Opulence!! 3 Story Home with tall Ceilings and curved Wood Ceiling in Foyer. Great Location just about 125 yards from the Private Beach for the Maravilla Community. Suzie Q boasts 7 bedrooms, 6 full Baths, 2 Half Baths, 2 Kitchens and 2 living areas. Both Kitchens have under counter ice makers and third floor Kitchen has 2 dishwashers and grand gas Stove with 5 burners. There are 5 Master bedrooms with Private baths and another bedroom with en-suite bath and another bedroom with Twin over full bunk with Trundle under. Sleeps 17 comfortably. Every room has a flat Screen TV and DVD-Blu Ray players. Every level of this home has Covered front and Rear Porches with the third floor having an additional spiral Staircase leading to roof top porch with Fantastic Gulf Views! This private Beach Access is one of the largest in the Destin/Miramar Beach area. You can also enjoy complimentary 2 chairs with Umbrella during peak seasons thru October. Living and full kitchen – Great for entertaining and cooking when hanging out by the pool. Huge King Master Suite with Private bath- Shower and jetted Tub and access to front porch. Front and Rear porches, front porch has spiral staircase leading to an open deck with gulf views for miles! Stunning white beaches, challenging golf and world-famous fishing define the Emerald Coast city of Destin. Snuggled against the Gulf of Mexico in northwest Florida, Destin is rightfully famed for its sugar-white sands and emerald-hued waters. And due to its plentiful and always hungry underwater population, Destin is widely known as the "world’s luckiest fishing village." Destin also harbors world-class resorts and rentals – and some of the best shopping and dining anywhere. And something new: Northwest Florida Regional Airport makes it easy to reach this Florida Panhandle vacation destination. Watersports – tons of it! Paddle boarding, Jet Ski, Deck boats, boogie boards, skiing, snorkeling, swimming and so much more! It’s hard to stop talking about Destin, so much to do and see! Everyone I encountered was polite and very easy to work with. Overall, the service was excellent. Great experience from booking to checking out. Easy process making the reservation and confirming our stay! Note ** Garage is for owner's use only.